Anita Louise Knettle (81) passed away on September 8, 2018. She was born January 7, 1937 in St. Paul, Kansas. She grew up with five brothers and sisters and lived in several Midwest towns as her father was relocated while working for the Katy railroad. By the time she entered high school they had settled down in Boonville, Missouri where Anita graduated from Boonville Catholic High School in 1955. During Anita’s high school years she met the love of her life, Arthur Knettle from Pilot Grove, Missouri. While Art went off to the Navy following graduation Anita remained in Boonville and worked at the local family-owned Holsum Bakery for a couple of years. On December 25, 1956 Art proposed to Anita while home on military leave from Naval Air Station Glynco, Brunswick, Georgia and they were married the following year on November 23, 1957. While in Brunswick Anita did bookkeeping for a couple of companies including Sea Pak Shrimp Co. on Saint Simons Island, Georgia. As the story goes, they were on an adventure, struggling to make ends meet, but easily developed a love of the warm weather, sand and surf of the southern Atlantic coast that lasted throughout her life. Anita and Art lived in Brunswick until early 1959 before relocating to Kansas City, Kansas. Once back in the Kansas City area Anita and Art decided to start their family and moved to Olathe where they welcomed their daughter, Donna. Her husband’s career as an air traffic controller took them to Chicago for a short but meaningful stay, as son Mark was born here, and then Jacksonville, FL for four years. There the family firmly cultivated their love of all things water and beach. In 1970 they returned to Olathe where they remained until Art retired from the FAA in 1992. That same year they built their retirement home in Bella Vista, AR on Lake Windsor where she enjoyed many family weekends and vacations with her children and grandchildren over the next twenty-five years. Anita was a very strong and determined woman, at age seventy-six she was still out on the lake waterskiing with her grandkids. She had a passion for flowers and nature and tending to her garden. Even up to her last days, her yard was still perfectly planted with her favorite flowers and plants. The home also became a sanctuary for hummingbirds, her favorite bird, and she and Art made it part of their daily routine to put out sugar water in several feeders. If you ever wanted to know a random fact she probably had one for you, as she spent a lot of time reading about nature and the outdoors and could tell one heck of a story. Anita was a warrior, a lover, a teacher, a storyteller, a family tradition keeper and so much more to all those that knew her. Her compassionate and caring spirit made her easy to love. Her physical presence may be gone, but her personality will never be forgotten and will continue to radiate through her family members and friends whom she made a lasting impact upon. Anita is survived by her husband Art of Bella Vista, AR; sister’s Karene Weimholt of Shawnee and Janet Bower (Dean) of Fort Smith, AR; brother Bernie O’Brien (Judy) of Odessa, MO; daughter Donna Miller (Mitch) of Overland Park; son Mark Knettle (Jamie) of Olathe and four grandchildren, Brian Miller of Bella Vista, AR; Lauren Miller of Dallas, TX; Scott Knettle, Kansas City; and Reed Knettle, Olathe. She is preceded in death by her two brothers Jim O’Brien of Mountain View, AR and Reggie O’Brien of Oklahoma City, OK; and brother-in-law, Bernie Weimholt. In lieu of flowers the family requests donations in her behalf to: St. Jude Children’s Research Hospital at 501 St. Jude Place, Memphis, TN, 38105 or www.stjude.org/donate. Add your memories to the guest book of Anita Knettle. Art and family, our deepest sympathy to you and Donna from me, Bob Hague of ATC acquaintance @ ZKC and ZCG and my daughter Lori (Hague) who was at Olathe High class of 1949 when Donna was. God bless you as you go forward in God's comfort and care. Bob & Lori. So sorry to hear of Anita's passing. She was a great lady and I always enjoyed being around her at family gatherings. My sincerest sympathy to all of you. A wonderful cook..no leftovers..pictures, stories of family, especially later..the grandchildren, hope-talks to keep hope in people and "it doesn't do any good to...". Water-skiing teacher to landlubbers...a genuine friendship in spite of distance..I (Laurie) will miss our problem solving phone conversations. Vaya con Dios dear friend. Anita my friend, you will be missed by all the folks in your life that you have touched in many ways. I can still recall seeing you on the lake skiing on one ski while my wife and I sat in the boat in amazement. I met Anita in May 1959, as Art and I would study together to become Air Traffic Controllers. Anita would invite me to stay and have the evening meal with her and Art. Some of the best memories of my life. I feel very fortunate that I talked to Anita on the phone just a little over a month before her passing. I was able to express the love my wife and I have (had), for her and Art. Thank you Anita for having a special place our life long memories. There is a special place God has for you in Heaven. I'm so very sorry to hear of the passing of Mrs. Knettle. I have some fond and funny memories from our years as neighbors. 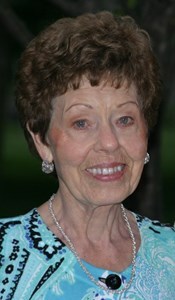 Mrs. Knettle was always smiling, and always had something to say! My thoughts and prayers are with you all during this most difficult time.